Spiral galaxy NGC 918 peeks through galactic dust. The spiral galaxy NGC 918. This day of the year is a funny one; people who write for a living try mightily to tie their particular field to the holidays. For an astronomy and scifi nerd, it’s relatively easy, whether it’s a Star Wars tree topper or an asteroid named Santa. Finding a little Christmas connection isn’t so much a chore. I was going through my emails to look over topics I could write about (and reply to a few queries I’d let sit for far too long) when I found the above image of the galaxy NGC 918, taken by my friend Adam Block using the 0.81-meter Schulman Telescope at the Mt. Lemmon SkyCenter in Arizona. In the email he sent me he titled it “Galaxy in the Mist”, which is poetic and accurate enough. NGC 918 is a spiral galaxy, a gorgeous and gravitationally bound collection of gas clouds, dust lanes, dark matter, and a hundred billion stars. It’s about 60 million light years away, which is kinda sorta in our neighborhood; think of it as the next town over, cosmically speaking. In 2009, after traveling for five dozen million years, light from an exploding star reached us here on Earth. It was dubbed SN 2009js — SN for supernova, 2009 the year it was discovered, and the letters indicate the number of such exploding stars seen that year, from a to z, then aa to az, and so on; js means several hundred were seen that year before this one. Curious, I did a quick literature search and found a paper describing the supernova; it was a tad unusual, but of a kind fairly well understood. In such an event a lot of heavy elements are forged from lighter ones, including radioactive nickel, which in turn powers the explosion. What stuck out for me about this particular supernova is that, by studying the light it emitted, astronomers determined it produced seven-tenths of one percent the mass of the Sun in nickel alone. Sounds small, doesn’t it? But the Sun is large, and if you prefer this is the equivalent of well over 2,000 times the mass of Earth! Imagine: 2,000 Earths, all made of solid nickel. And compared to others, this supernova underproduced nickel. So how does that tie in to Christmas? It doesn’t. It’s just cool, and amazing. But I’m not done. Look at the image again. See the wisps and tendrils, gray and dark? That’s dust, small grains of minerals and long-chain carbon-based molecules, produced in abundance when stars die. But that stuff you see isn’t in NGC 918, it’s in our own Milky Way, created by the Sun’s brethren as they aged and shuffled off this mortal coil. It’s the carbon part that’s funny. Those long molecular chains can be made in many ways, including by burning organic material. Like, say wood. And where do you burn wood? So there’s your traditional holiday tie-in to astronomy. It so happens there’s a small opening in the dust, a thinner area big enough for us to see NGC 918 through it. 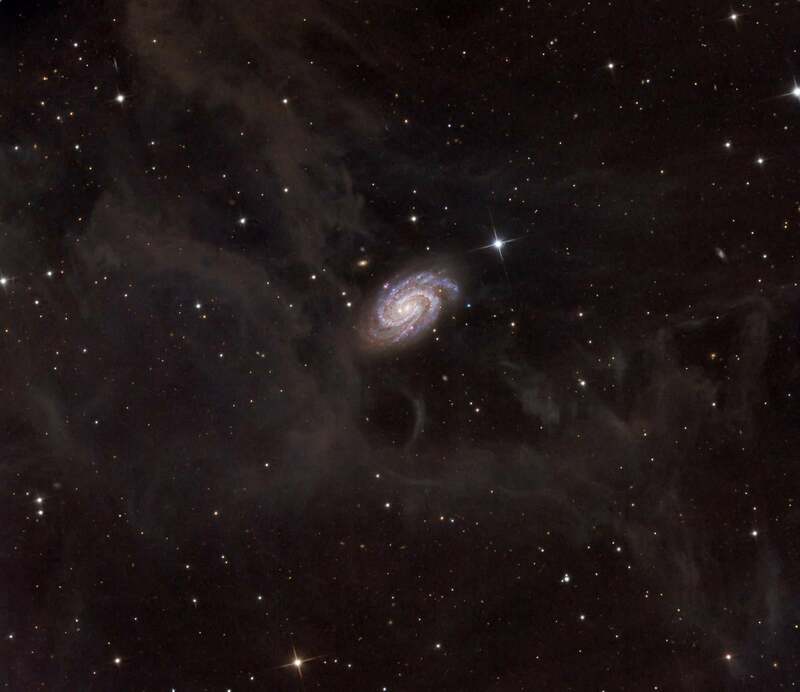 That galaxy is no Santa, but its light had to pass through a lot of soot, just like that coating the walls of a chimney. Now you know why I gave this article the title I did. If you celebrate Christmas or not, Hanukkah or not, or any holiday or not, NGC 918 is there, its light still flows down from the Universe, and we as a species are smart enough and care enough to study it. That can be, sometimes, enough to make me be of good cheer.